Just what the heck constitutes a tweak? Although described by the venerate J. Gordon Holt in his 1990 book The Audio Glossary as, "to fine tune something to the nth degree of perfection", I simply suggest that it encompasses any change you can impart to your music reproduction system or listening environment which increases your enjoyment of the music. This may range from something as seemingly innocuous as moving the speakers around your listening room to something as substantial as replacing the internal power supply capacitors in your amp with an outboard bank of larger, high grade supply caps. Moving your speakers around in your room in order to counter a node or to get them away from a primary reflective surface such as a side wall may take all of 30 seconds and produce wondrous results. Modifying the power supply of your amp or receiver by adding an outboard cap bank may require hours of labor, hundreds of dollars and may offer only a slight but indisputable improvement to the dynamic contrasts in your music. Which one was the most cost effective? Objectively, any positive change which can be affected with only 30 seconds of your time and with absolutely no money invested must be deemed indisputably significant. Subjectively, the newly found freedom from congestion and the improved localization and individuality of massed strings during complex dynamic passages realized by the "stiffening" of the amplifiers power supply, whatever the cost, must also be seen as meaningful. Get my point? When talking tweak, we are talking about degree! In this category, one man's mountain is another's mole hill. The more experience you have at discerning differences, the more accurately calibrated your "musical yardstick", the more subtle the changes you will be able to note, and thereby appreciate, in your system. Let's take your current music system. You've attended every concert you could get to in an ongoing attempt to more finely tune your "musical yardstick", and thereby have become more able to discern equipment which sounds more musical. You've spent years reading all the different "respectable" publications in order to put together a short list of components for you to audition (I know none of you ever bought a component unheard simply because of a good review, right?). You have paid your dues by going to every possible shop, store and home where you had the opportunity of hearing a promising system in order to weed out the components which just didn't get it for you. After all this labor, you have finally assembled your "dream system". Well, at least the version of the dream you can afford right now. Now it is time to just sit back and enjoy the music, right? NOT! Now you can begin the task of fine tuning your system; you can begin to bring this assembly of individual black boxes and electron hoses to life! Look, I'm not saying that tweaking alone will turn the battered but working old tube amp you bought at a yard sale for ten bucks into a pair of Clayton Audio M-70's. But I guarantee you that you will never know how good your system can truly sound until you give it every opportunity to do so! By using your ingenuity and listening skills, you can wring every last vestige of musical nirvana from the pieces you do have to work with. That, my friends, is what the art of tweaking is all about. In this space I will introduce you to tweaks which I have found over my nearly three decades of experimenting in this hobby/sport/disease which move you closer to the music. In addition to detailing the application of the tweak under consideration, I will also describe the sonic results, "painting" a sonic portrait so to speak. This will alert you as to what to be listening for so that you can more readily conclude how effective the results of your labors have been. Whenever possible, and that may not be too often, I will try to credit who or how I discovered this transformation. I hope to hear both feedback on your experiences with these suggestions and about your favorite tweaks. Should you submit a tweak which I find meritorious, I will share that tweak with our readers here and identify you as the contributor. Drop your suggestions to me via my email address posted at the end of this article. And at last, on to our sonic alchemy. We are going to address minimizing each component's AC potential (Say what? ...read on). I first was alerted to this treatment by Enid Lumley, writing for The Absolute Sound way back in 1981. For years both the mainstream audio press and the engineering community pooh-poohed this suggestion as ludicrous. Now so many people acknowledge its validity that many manufacturers owners manuals even make mention of the audibility of plug orientation. To experience this magic, you will need an electronic test device known as a Volt/Ohm Meter (hereafter referred to by its shorthand name, a VOM). A VOM is simply a device which, through the use of its two attached probes, allows you to measure electronic voltages, currents and impedances. If you don't have one already, you can run down to your local Radio Shack and acquire one for about $25. There are cheaper units available, but both their readability and accuracy must come into question. There is a dedicated device specifically for this purpose; the Elfix Polarity Meter, which is available from Audio Advisor for about $30. However, by choosing a VOM, your purchase is not limited to a singular purpose. A VOM can be used for a wide variety of other applications, from checking suspect blown fuses and burnt out bulbs to finding tripped circuits and gauging the reserve power left in all varieties of batteries. If you already own and are familiar with the use of such a device, feel free to skip this paragraph. If not, I would suggest the purchase of the Pocket Digital Meter (part number 22-179 at the Shack) with a list price of $24.95. They make a similarly priced analog unit, but going to a digital read out makes for a faster and more accurate reading. Trying to get an exact voltage from the very fine needle on an analog type sweep scale can be maddening for the uninitiated. Alternating current, or AC, is what you get on tap from all those sockets in your walls. In the United States, it is delivered according to the National Electrical Code at 240 volts and at a frequency of 60 cycles per second. The standard wall socket usually includes an over/under pair of receptacles made up of two different sized vertical slots, with a round hole immediately below them. The wider of the two slots is known as the neutral line (which provides a grounded conductor back to the service panel), the narrow slot offers the hot feed (it carries "live" 120 volt AC from the service panel) and the round aperture beneath is connected to the household ground (a direct ground for safety in case of a short circuit). If this arrangement, known as polarity, is reversed so that the hot is wired to the neutral side, an exposed socket can deliver a shock even when the switch is off. In your audio equipment, the third ground line is tied to the metal case of the component, or its chassis. Every piece of electronics uses a power transformer, whose primary purpose is to either step up or down the AC supplied by the wall socket. Their secondary purpose, the one we will be concerning ourselves with, is the transformers responsibility of isolating the equipment chassis from that same AC. It guarantees that the chassis can never get directly connected with the hot side of the power line. Like everything else in this wonderful world we live in, transformers are not perfect. They inevitably leak small amounts of the current, and the leak is almost always closer to one side of the transformers primary winding than to the other. This carries the chassis closer to the AC lines neutral or hot side, depending on which way the plug is oriented in the wall socket. When two components exhibit different chassis AC potentials due to differing leakage in their transformers, current flows through the shield ground of a patch cable between them. This in effect causes what is known as a ground loop, both carrying and generating assorted noises, most often heard as buzzing or humming. This is a bad thing, campers! Power cords come in two varieties, the two blade version that uses one wider blade which will not fit into the narrow hot slot in the socket and the three pronged type which include a third round prong below the two blades to establish a ground connection. Both constructions guarantee correct polarity by allowing the plug to be inserted into the socket in only one direction. While you may initially assume the three pronged cords to be inherently better, due to their ability to introduce multiple grounds to the audio system, they actually serve to further complicate the ground looping problems. Whichever style plug your equipment uses, you will probably need to employee some "cheater" plugs to mechanically circumvent the power cord's polarity. These adapters are readily available at hardware and home building supply stores for about a buck. They are nothing more than an adapter built to accept three pronged polarized plugs on one side and offering only two blades protruding from the other. Unfortunately, most of them are similarly polarized on the output side by using the wide/narrow method. This means you will have to trim the wide blade (using a file) so you will be able to try BOTH orientations (WARNING - Some units may have their warranty voided if you bypass the direct ground! Read your owners manual. 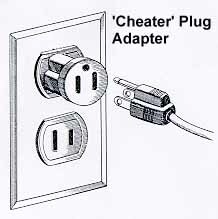 Furthermore, the use of 'cheater' plugs may violate electrical safety laws for your community. Proceed at your own risk.). This is where the tweaking comes in! First, disconnect the component under examination from every other component to which it is attached. You simply remove all the patch cords going to and from this component. This is crucial as there must be no shared ground paths between the component you are examining and any other. With your VOM set to AC volts (be sure you are not set to DC!) you are ready to measure the AC floating on the components chassis. This is done by first placing the black probe of the VOM securely into the ground receptacle (the round aperture, not one of the vertical slots!) on the wall socket you are using to power this component. You may want to find something to facilitate a secure connection here, such as having a friend help you or applying a slight bend to the probe in order to keep it firmly in place. Then, use the red probe to find a good chassis ground point on the component and read the resultant voltage from the meter's digital readout. Usually any of the screws on the back panel will work nicely. Make sure that you are contacting a bare chassis point (bare metal, not a paint covered surface). It may be necessary to loosen a screw to get a clean, unpainted test point. After noting the reading on the meter, unplug the device, apply your modified cheater plug, reverse the previous plug orientation and take a second reading. Your final orientation for the plug should be the orientation that yields the LOWEST AC voltage reading. Repeat this procedure with the next component in your system, remembering to disconnect all its patch cords and thereby isolate it from the rest of the system. When you have checked and oriented each AC plug in your system (don't forget extension cords and power conditioners, if applicable) to give you the lowest AC potential for each and every unit in your system, reconnect all your patch cords, power up, light up a CD or drop needle to groove .... and get ready to be astonished. Everything just got better! I do mean everything! Most notable will be a quieter background from which everything emanates yielding more "blackness" to the noise floor. This means silent and quiet passages just got quieter and micro dynamics just increased significantly, as did the low level resolving power of your system. Sound staging just widened, deepened and became better layered and the images just got more localized and better focused. Vocals and other key mid-range instruments now have less glare and haze, offering a smoother texture to their presentation. There is more, but I won't babble on. You get the picture! One final note. I have noticed that having more than one ground in the system can still induce noises even though all plugs are oriented to the lowest potential. One method I have found useful to combat this is to make sure there is only one house ground connection in the system. When possible, I have found it is preferable to leave only the power amp (or, when plug orientation will not permit, the pre amp) grounded and to float all source component grounds using a cheater plug, all the while maintaining the lowest AC potential. This is one of the most dramatic and cost effective tweaks I know. I have done this to many systems for many people over the years. Most felt as if we had created a new system entirely! Till next time, enjoy!